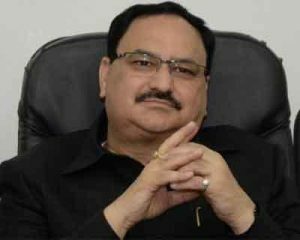 New Delhi: Nearly a month after the rollout of the Centre’s PMJAY health insurance scheme, one lakh people have availed the benefits of the ambitious programme, Union Health Minister J P Nadda said Sunday. The Pradhan Mantri Jan Arogya Yojana (previously Ayushman Bharat), touted as the world’s largest health insurance programme, was launched pan-India by the prime minister from Jharkhand on September 23. “Prime Minister Narendra Modi @narendramodi launched Pradhan Mantri Jan Arogya Yojana on September 23 and within a month, one lakh beneficiaries have benefitted from it. We are committed to ensure the benefits of the scheme reach the last man,” Nadda said in a tweet in Hindi. The scheme is expected to benefit up to 55 crore people, providing them with an annual health cover of Rs 5 lakh for secondary and tertiary care hospitalisation through a network of Empanelled Health Care Providers (EHCP). On October 5, two weeks after the launch of the PMJAY, Indu Bhushan, CEO of National Health Agency, said around 38,000 people have availed the benefits of the scheme. The health ministry has said the scheme will help in reducing expenditure on hospitalizations and help mitigate the financial risk arising out of catastrophic health episodes. THE BEST DICISION BY THE BJP / PM MODI GOVERNMENT HELPFUL TO MILLIONS OF POOR, HELPLESS & UNDER PRIVILEGED CITIZENS OF OUR COUNTRY. WHICH DISCUSSED DURING EARLIER ATALJI GOVERNMENT , THOUGH IT TOOK MORE THAN 15 YEARS , AT LEAST IT IS IMPLEMENTED . I CONGRATULATE THE GOVERNMENT FOR THE GREAT ACT.